THE WEST COAST’S LARGEST ESTUARY IS BEING STARVED OF WATER | "Global Possibilities"
A report warns the decades-long diversion of rivers that feed San Francisco Bay has put the vital ecosystem on the verge of collapse. California’s vibrant and biodiverse San Francisco Bay, the biggest estuary on the West Coast of North America, is running out of freshwater. In some years, as much as two-thirds of the freshwater that would normally reach the bay—an estuary where freshwater and ocean water mix—is diverted for urban and agricultural use, effectively starving the ecosystem, according to a new report from the Bay Institute, an environmental organization dedicated to protecting and restoring the local watershed. The findings were striking. Freshwater input into the bay has been dramatically cut—on average more than 50 percent a year and as much as 65 percent in some years. As salinity has increased, native fish species have moved upstream to riskier habitats. Invasive species such as the overbite clam and the inland silverside fish, which can withstand the saltier waters, have moved in. Sediment flows have been cut in half, causing sandy beaches to shrink and increasing coastal erosion. Pollutants have built up, allowing toxic algae blooms to grow. Birds and whales that depend on food from the bay have suffered. Bobker explained that the normal function of the bay requires the inflow of both fresh and saline waters. “In order to have healthy wetlands,” he said, “you should have wetlands that represent a range of salinity.” Some waters should be fresher, while others should be brackish, to preserve the natural plant and animal communities that evolved there. Other organizations praised the Bay Institute’s study. “This report gives a very important scientific foundation documenting the fact that agribusiness and federal and state regulators have imposed permanent drought conditions on the bay-delta, starving the ecosystem of freshwater, with disastrous consequences for fish and wildlife,” said Jeff Miller, conservation advocate for the Center for Biological Diversity. “It comes at a critical time, while federal and state regulators are trying to divert even more water from the delta through peripheral tunnels.” He was referring to a plan to build $16 billion twin tunnels to carry water from Northern California to agricultural and urban districts in the southern half of the state. The tunnel is one of the many elements of what is referred to as California’s “water wars,” a decades-long fight between farms, urban areas, environmental groups, and other interests over the state’s water supplies. Bobker said he hopes the report can start to influence the discussion about water flow and how it affects the bay. “There’s a real need for awareness in the Bay Area of this problem,” he said, noting that the tide of public perception is starting to shift. He pointed to a ballot measure passed in June by a two-thirds vote in the nine-county Bay Area that established a $12 per parcel property tax to underwrite wetland restoration. If we look at any of several recent professional or academic studies of California’s water supply sustainability and the impact of ongoing climate change the results are positively frightening. In a scenario where average temperature rise of 3-4 C above the common 1880s baseline is reached by mid-century, California is projected to be 10-13 million acre-feet short on supply annually, while surrounding States and most of urban Mexico are also forecast to experience substantial to catastrophic supply shortages also. This amount of water short would be enough water to supply all California residential use, all non-agricultural business use, and all power plant cooling use, plus a substantial minority percentage of agricultural use too. Moreover, a recent State study of the cost to supply just 20% of current residential use with desalinization forecast a project cost in-excess of $5 trillion, which if we divide by the number of supplied households would increase water costs by 400-500%. What would a $1200 water bill every month do to your family budget? Like several other Western States, most Southwestern US urban areas, and most Mexican major urban areas, California is rapidly overdrawing its aquifers at close to triple the declining recharge rate. It is only a matter of time before all known fresh aquifer capacity will be exhausted too. Meanwhile, every Western US State and Mexico continue to grow at a fairly rapid rate of up to over 5% annually in El Paso/Juarez, even though they have already exhausted one aquifer and the Rio Grande is down by 22% in annual runoff from the average of 1900 to 1970. I prefer to look at this issue at a far-larger scale than just one estuary here and another section of river there. 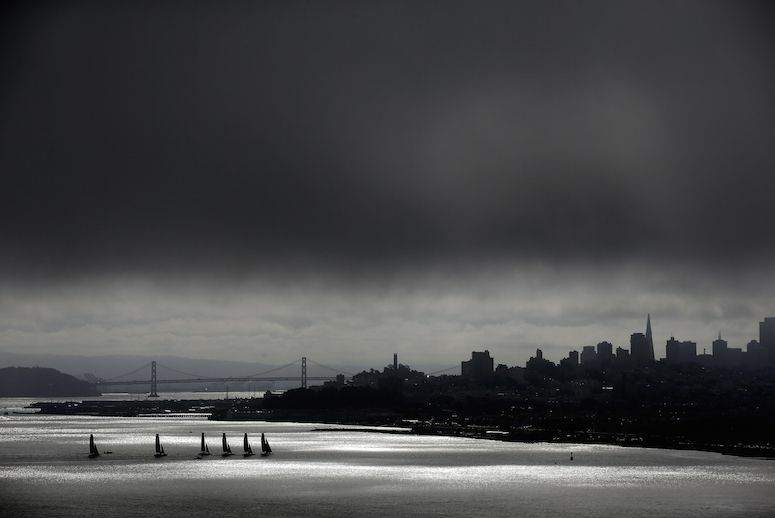 The fact is that if the human race can’t bring itself to rapidly reduce global carbon and CO2e emissions, sea level rise will quickly flood not only San Francisco Bay but also the Sacramento River as far as Sacramento, where the river elevation is only 10 feet above sea-level, a level expected to be reached between 2050-2075. After that the only species that will survive there will be salt water species unless somebody wants to spring for the immense cost of building a dam and locks large-enough for ships across the mouth of SF Bay. Considering recent progress in moving away from fossil fuel use here in the US, Canada, and several Asian countries that out-populate us substantially, frankly I do not see a promising future for the Bay estuary as beyond a certain point, keeping the salt water out will become impossible. Of course, I am also one of many regional sustainability planners forecasting immense refugee flows and a destroyed economy after many urban areas as-large as Los Angeles, Phoenix, Mexico City, and Guadalajara are forced to shed substantial amounts of population after aquifers they depend-on for a substantial percentage of current supply simply run dry. Like Lord Nicholas Stern of the British Royal Society and the Grantham Institute I am worried about the potential for immense refugee flows. Just here on the North American continent we could see 30-60 million refugees flooding northward as their water supply becomes compromised, a problem that pales at the same issue facing Southern Asia, which could involve up to one billion refugees, of which we might have to take-in a couple hundred million of them to prevent their deaths. Does anyone besides me know where in the entire Western US we can accommodate say half that number of refugees without destroying our own fragile chance at supply sustainability, in an economic environment quite similar to that of the Great Depression after a substantial percentage of the global economy is destroyed? Say, what is 40% of eight billion? That’s right, 3.2 billion, which is the number of people worldwide which are forecast to lack a fresh water supply by 2030, just 13 years from now, according to a new study out just two days ago. I would recommend reading this Alternet news item about the study from October 18th, so that we can then have a serious discussion on what is our best chance of preventing billions of human deaths, a problem which would also cause a global economic depression 100 times worse than the Great Depression. I am in my final year of working on a Master’s degree in Urban & Regional Planning and Regional Sustainability at the University of Colorado to go with 30 years of experience in US national-scale wholesale fresh food supply chain, warehousing, and distribution. According to my own research we are in absolutely desperate shape as fully 80% of all fresh water used in the US goes into food production. Certainly we can cut back on meat consumption as well as on growing low-yield crops, and urban areas must rapidly work toward building and operating large hydroponic vegetable greenhouses, which use a lot less water than do crops grown outdoors traditionally in dirt., Another reason to build toward substantial localization of our food supply is to reduce transport greenhouse gas emissions. On an even more-frightful subject, another very recent European study of plant and tree carbon uptake has greatly accelerated the previous forecast timeframe for plants and trees to become net carbon emitters, to as soon as 2035 to 2040. Once this occurs, if we have not reduced global man-made carbon and CO2e emissions by at-least 80% at-least 15-20 years beforehand, we will see runaway catastrophic warming along with an accelerated drawdown of remaining aquifers and a greatly increased rate of surface water evaporation, a scenario that includes a very unhappy ending for billions of people if not the entire human race. Right now we only have 10-15 years to rapidly work toward the localization of our food supply as well as the localization of as much of the global economy as-possible too. We absolutely must build more water storage capacity whether behind dams or in giant storage tanks. Within 15 years, any carbon emission outside of our food industry or building additional water storage capacity must be eliminated if we want our own children to have a fair chance of living-out their full natural lives on this planet. As for your increasingly-fragile San Francisco Bay Estuary ecosystem, I give it a 1-2% chance of survival in its current low-salinity form within 20-30 years unless you are willing to spend many trillions of dollars on a project that would require millions of cubic yards of concrete and would substantially worsen global temperature rise. My educated opinion says that it is already 10-20 years too-late to save the estuary without immense cost, a cost which could include the deaths of a 6-7 figure sum of people if we fail to plan for and successfully-manage the biggest crisis that the human race has ever faced.